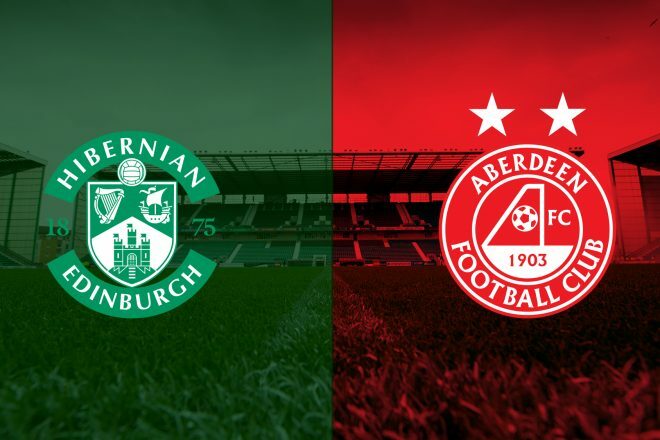 Aberdeen are back on the road this week with a crucial double-header as they face Hibernian in the Quarter-Final of the Betfred League Cup. That comes before Saturday’s trip to Celtic Park, but at the moment all of the focus turns to Easter Road. Last season The Dons were dispatched by Motherwell at the same stage and will look to get themselves back to Hampden in October. Both teams are coming into this one on the back of weekend victories with Hibernian seeing off Dundee 3-0 and James Wilson scored on his Pittodrie debut to ensure The Dons grabbed the points against Motherwell. Hibs entered the same stage of the Betfred Cup as Aberdeen due to both sides competing in Europe and Neil Lennon’s men beat a resilient Ross County in the last round to set up a mouth-watering clash with The Dons thanks to a late winner from Daryl Horgan. 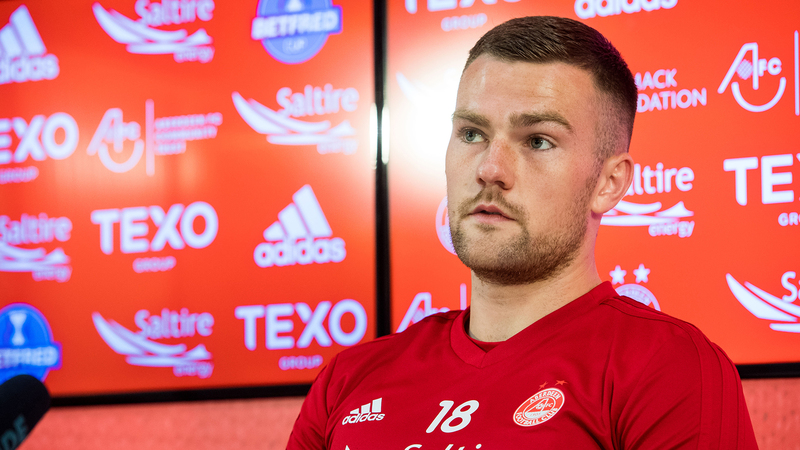 Derek McInnes and Michael Devlin spoke to the media on Monday lunchtime before the team departed for Edinburgh. “When the tie was drawn we all said it was a tough one, but one we’d be relishing and looking forward to. That’s exactly what it is, and Hibs go into the game a couple of points ahead of us in the league and off the back of a 3-0 away victory. I’m sure they’ll be very confident going into the game, but we back ourselves. We go down there, and I don’t think there will be much between the teams. We’ve already been down there and drawn and I think we saw some good of us in that performance, but also a lot of good in Hibs. For us to beat Hibs we have to play very well and it’s important we just manage our own game. “It’s been a while (since playing with McKenna) with Scott’s injury and my suspension. We’ve got a real competitive squad and there’s no given that me and Scott are going to play together and it’s to us to make sure our performance levels are at what the manager expects. If we do that then hopefully we’ll be playing together. We’re good mates off the pitch, but we need to make sure it’s right off the pitch and take our opportunity and fortunately on Saturday we were able to get a clean sheet and the team teams as a whole defended great and it made our job fairly simple. Tuesday will be the 24th meeting between the teams in the League Cup and it’s the hosts that have the slightly better record. There have been ten wins going to the Leith side with seven victories for Aberdeen. The first meeting was a two-legged Quarter-Final back in season 50/51 and was the first of four ties in the space of three weeks. The Dons ran out 4-1 winners in the first leg, but Hibs responded with the same margin of victory four days later which meant a replay was required. Once again, the teams could not be separated at Ibrox and the two reconvened a day later at Hampden where Hibs finally got the job done in a resounding 5-1 win. The next fourteen meetings in the cup would be played at the group stage before the teams met at the knockout stage. The 1978 Semi-Final was won by Stuart Kennedy’s extra time goal at Dens Park which sent The Dons through to what would become an ill-fated Final against Rangers. 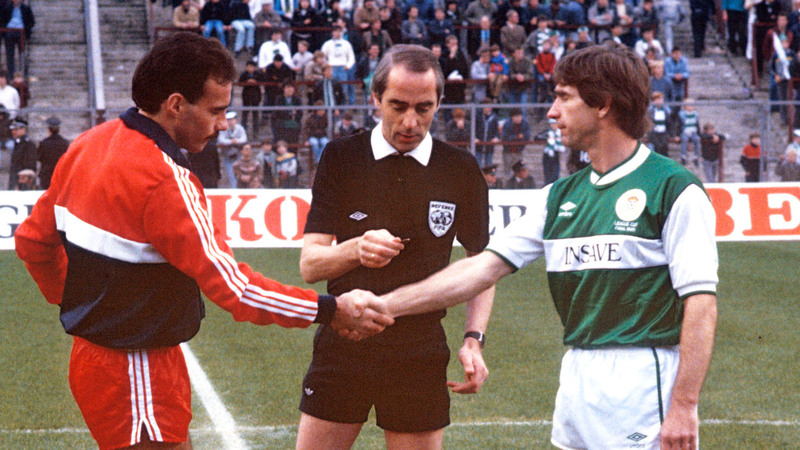 The only time the teams have met in the cup final was the 1985 edition of the competition. Alex Ferguson went into the match at Hampden knowing it was the only trophy he was yet to collect as Dons manager, but on the day his team delivered. A double from Eric Black either side of a diving header from Billy Stark meant the League Cup was coming back to Pittodrie for the first time in nine years. It was the first of a memorable cup double as The Dons would see off the other half of Edinburgh in the Scottish Cup in May. The last two meetings have gone in favour of Hibs with wins in the at Easter Road 1998 Third Round and as recent as 2015. The last tie put an end to the Dons’ winning start to the season as the then Championship won 2-0 against a jaded Aberdeen side. Please note there will be a limited amount of tickets available from the ticket pod at the South Stand (not the main ticket office) tomorrow evening. The Stadium is situated on the North East side of the City of Edinburgh and is on the east side of Easter Road, in Albion Place/Road. Aberdeen Supporters will be accommodated in the South Stand. Private vehicle parking is best done to the west of Easter Road and outside the TTRO (Temporary Traffic Restriction Order) area which is enforced on match day. If you can’t make the game RedTV will be live on the air at 7.30pm with audio and video for international subscribers. Former Dons player Michael Hart will join the RedTV commentary team and we post match we will have reaction, goals, highlights and a full match replay. 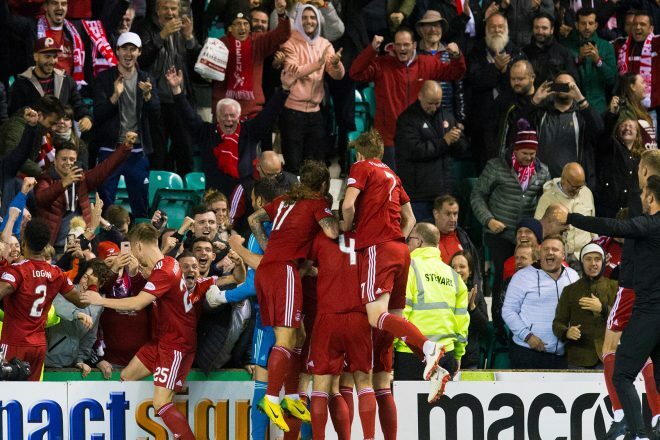 Aberdeen are heading for the semi-finals after a dramatic Betfred Cup tie at Easter Road. After the sides couldn’t be separated through 120 minutes the match was decided by penalties and The Dons got the job done in the shootout. 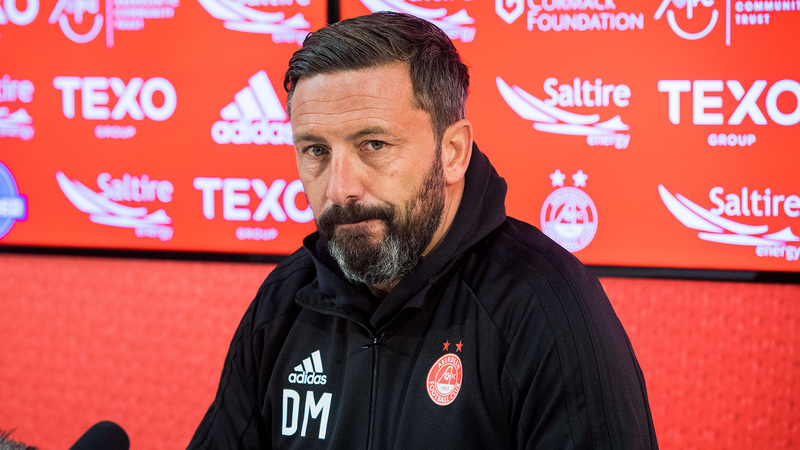 Derek McInnes made one change from the side that won on Saturday against Motherwell – Max Lowe came in for Niall McGinn who dropped to the bench. Niall did have a slight injury concern before the game. Neil Lennon brought Ryan Porteous, Oli Shaw and Emerson Hyndman into his starting XI with David Gray, Daryl Horgan and Vykintas Slivka making way from the side that beat Dundee. On dry but very breezy night, Aberdeen lined up with a back three of Considine, McKenna and Devlin. In the second minute Aberdeen won a free kick when Shinnie was fouled in a fairly dangerous position. Ball floated the ball over which Devlin won and headed back towards goal. Considine got a touch which created some ping ball inside the six-yard box but somehow Hibs survived and were able to clear. A minute Logan won another free kick when he was fouled by Stevenson. This time Mackay-Steven tried to whip the ball in at pace but he got too much on it and the ball sailed over the bar. A good start from the Dons though. After seven minutes Lowe was played in down the left. He had time to look up and tried to pick out GMS who managed to get a shot on target but it was blocked. Lowe then got it back and floated it over for Cosgrove but he could not win his header. A major let off for Aberdeen a minute later when Hyndman with a neat forward pass found Kamberi inside the area. The striker rounded Lewis but then proceeded to put his shot into the side netting. He should have scored. Great play by Wilson on nine minutes who held the ball up, turned and ran at pace before threading a ball through which very neatly found GMS. It was a lovely through ball but Bogdan was alert and well out of his box cleared the danger. On 12 minutes Hibs won the first corner but Aberdeen cleared their lines without too much concern. A pulsating start as expected. 16 minutes in and McKenna gave away the ball after a careless pass on the half way line. The Dons were out of shape and Hibs worked it to Hyndman inside the area but Devlin did really well to prevent the American getting a clean shot away. In the 20th minute Logan swung over an early ball looking for Cosgrove but the striker could not get a touch. A good idea though as the striker was one on one with the last defender. It was a very even game at this stage. In the 23rd minute another Aberdeen free kick was not dealt with by the Hibs defence. Considine did well to lay it of for GMS and his first-time volley caught the side netting. He just sliced it slightly. A minute later Dom Ball was adjudged to have given away a free kick 30 yards out. Looked a good tackle on first viewing. Stevie Mallan, who has scored some stunning free kicks already this season, was a long way out but still went for it – Lewis was able to watch the ball land on the roof of the net. A good effort but the keeper had it covered. McKenna did just enough to deal with a dangerous cross on 26 minutes. Hibs were starting to build some pressure but Aberdeen had a good break on 28 minutes. The cross was not up to much but Lowe and then Wilson won the ball back and then won a free kick in a great area. Ball took it and his brilliant effort beat the keeper but crashed off the bar and down before being cleared. A brilliant effort. Back came the home side. Kamberi found Hyndman and his shot from distance caused real problems for Lewis as the ball moved about all over the place in the wind and the keeper in the end was relived to see it go behind for a corner. Aberdeen cleared that but when Devlin was booked for a foul on Kamberi they had another set piece to defend. Which they did. On 34 minutes the home side had the ball in the net when Martin Boyle pounced on a through ball and fired it low past Lewis. However, the officials spotted that Boyle had used an arm to control the ball in the build up. A great ball from Mallan and a let off for the visitors. On 35 minutes Hyndman was booked for catching Devlin. A minute later Boyle again was in the think of the action when he broke clear on the right. He has all the time in the world but from an angle put his shot well wide. Joe Lewis did everything he could to stand up for as long as possible. The Dons were living very dangerously. Boyle was exploiting the gap between Lowe and Considine and Mallan was finding space in the middle of the park. On 38 minutes Boyle again caused problems and his shot was deflected behind for a corner. Aberdeen then broke and had a really good two on two but Wilson and GMS could not quite work it and Ambrose was able to get a foot in. The big defender did very well but a very encouraging break though. On 41 minutes Mallan was booked for a foul on Cosgrove as the Dons again looked to break. A minute later Hibs had a break and Kamberi fired in a shot which Lewis parried. Hyndman was about to get the rebound, but Dom Ball did brilliantly to get his body in front of the Hibs man to stop him tapping home. A really entertaining first 45 minutes. The home side started the second half on top but again the Dons defence held firm. In the 50th minute Wilson, in a rare Aberdeen attack beat a couple of players but was flagged offside after a neat one two. On 53 minutes, after good link up play by Cosgrove, GMS was able to get a shot away but Bogdan was equal to it. His first save of the night. A minute later a Hibs corner was hammered over by Mark Milligan – thankfully the ball fell for a defender. Then Aberdeen had a chance when GMS won a free kick out wide but Ambrose headed clear. In the 59th minute Kamberi beat Devlin with a nice turn and got to the ball ahead of McKenna. The striker came inside and fired a shot over. An hour in Max Lowe was replaced by Niall McGinn as the Dons moved to a back four. On 64 minutes another free kick for Mallan but he put the ball past the post and then Considine did just enough to keep out Boyle. With thirty odd minutes to go it was still a very open game. On 67 minutes Aberdeen won their first corner of the second half. McGinn’s ball was over hit before Wilson’s shot was deflected into the hands of Bogdan. On 69 minutes Joe Lewis was called into action from a free kick and did really well to keep out Paul Hanlon at the back post. Things were starting to get very nervous. On 72 minutes Wilson tried his luck from distance but his shot never had enough on it to trouble Bogdan. The striker was beginning to tire. With 15 minutes to go Considine was booked for taking down Boyle even though he claimed he got the ball. A minute after that Boyle raced clear on the left and picked out Kamberi but thankfully he could not get a strong enough touch. At the other end Aberdeen were getting the odd attack going but Ambrose was having a great game at the back for Hibs. On 78 minutes Cosgrove, who had run himself into the ground, was replaced by Stevie May. That same minute Hyndman pulled a shot wide. Again he should have done better. He had another chance two minutes later when a poor Lewis clearance gave Hibs a great attacking platform but the keeper produced a good low save down to his right. On 81 minutes another really promising Aberdeen break was stopped by Ambrose. On 83 minutes Ambrose stopped GMS and this time the referee gave a foul over on the touchline which Bogdan just managed to claim with one hand. Devlin was waiting to pounce. On 84 minutes Boyle had the ball in the net but was flagged offside. The flag was up early. Seconds later though the flag did not go up and Shaw was clean through, but went for goal instead of squaring it and put his shot wide. A golden chance wasted by the Edinburgh side. The best chance of the 90. On 85 minutes GMS this time beat Ambrose so Porteous took him down. A great platform for Aberdeen but May blasted the free kick into the wall. May should have put it into a better area. Three minutes to go, Wilson won a corner but it was also wasted. The deliveries needed to be better. There were three minutes of additional time – Aberdeen looked the better team and McGinn so nearly worked an opening with Wilson but his shot was blocked. Wilson’s legs had gone and was then replaced by Forrester before the full-time whistle went. James had once again put in an excellent shift. Hibs substitute Thomas Agyepong was the first to threaten at the start of extra time – Lewis was well positioned to save. Stevie May appealed for a penalty before Dom Ball almost gave a goal away with a really lose pass back, thankfully Lewis beat Kamberi to the ball. Then six minutes into extra time a real opening for Stevie May but he pulled his shot wide. It was the best chance Aberdeen had up to that point but May could not direct his shot on target. The pace of the game of the slowed right down as both teams tried to enjoy some possession. What a chance after 11 minutes. A really well worked Aberdeen move saw Ball play in McGinn but the winger got his shot horribly wrong. He was at an angle but was the one player who had the quality to score from there. GMS claimed for a free kick in the edge of the area before Shaw’s heavy touch wasted another opening. 13 minutes in, Hibs brought on Whittaker and Slivka. On the stroke of half time in extra time Ball was booked for a pull on Agyepong. A half chance for May at the restart – he just could not lift the ball over Bogdan. The keeper actually made a good save. There were a lot of tired legs out there and if someone was going to find a winner, it was more likely to come from a mistake than a piece of brilliance. Then Hibernian put together some possession and held the ball for two or three minutes. Aberdeen sat deep and could not get the ball but Bartley eventually curled a shot wide. With seven minutes to go Anderson replaced Ball. The Dons needed some legs to get them up the park. Hibs then wasted another golden opportunity when Boyle and Shaw got in each others way. The referee gave a corner but it looked like the two Hibs players had go the final touch at the back post. The Aberdeen fans were doing there best to try and lift the players who looked shattered. Graeme Shinnie did maybe not have his best performance in a red shirt but by god he did not hide out there. He was incredible in extra time and his energy dragged his team mates along as well. A special player and a real leader. He also stepped forward to take the first spot kick. And so to penalty kicks. It’s the most dramatic way to win a game of football, but thankfully the victors were The Dons and the Red Army will once again travel to Hampden. Thank you to the 1715 Dons fans that travelled to the capital this evening. See you at the Semi-Final next month!